This little salad is great for lunch, or goes well along side a steak, chicken or seafood dinner. The nutritional value of this salad is a plus as well. You can add any bean to it to jazz it up anyway you like. It’s something easy to make for a weeknight as well. As a stay at home mom I am always on the run and trying to come up with different ideas for dinner. 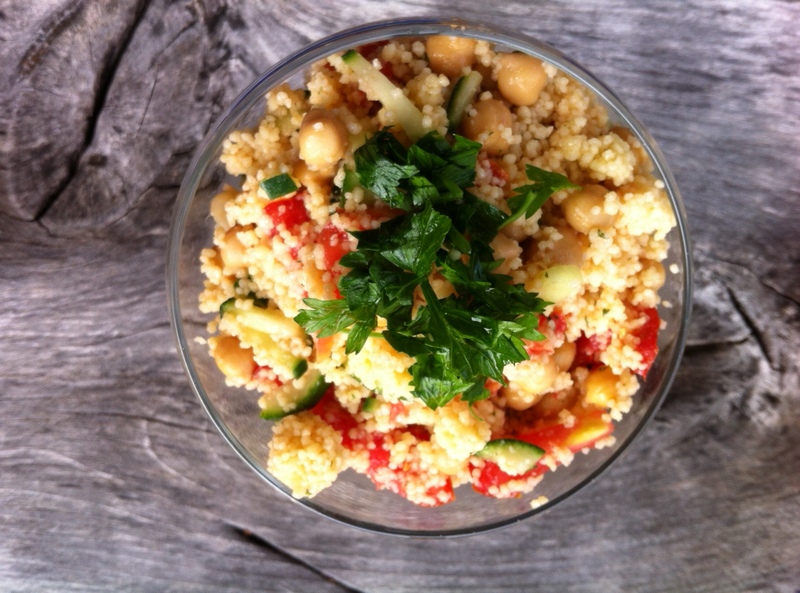 I hope you enjoy my little salad couscous twist. In a large bowl toss all the ingredients together. Enjoy!! My family and I love couscous. I fix it often… It doesn’t take much of anything to make it taste good. I too enjoy creating my own recipes or adding my own touch to them . Thanks for sharing. My family and I love couscous. I fix it often… It doesn’t take much to make it taste good. I too enjoy creating my own recipes or adding my own touch to them. Thanks for sharing. this looks awesome! i’ve always been a diehard fan of tabbouleh, so i’m going to have to give this recipe a go. couscous can be a little hard to find in japan, but i think i’ll be able to make due. seems like a good hearty dish i might be able to eat right out of the fridge on those “i don’t feel like cooking today” days. how do you feel about fresh mint? it goes so well with both cucumber and lemon, so it might be really nice when paired with the salad while it is still super cold.